On Wednesday night, along with other cycling fans across Canada, we attended the Canadian big screen premiere of Chasing Legends; written, directed and edited by self-taught film maker Jason Berry. The movie followed Team HTC-Columbia during the 2009 Tour de France. For those of us in southern Ontario, that meant braving a snowstorm that had shut down much of the province. We were not alone, as the show in Ancaster we attended was pretty much sold-out, as was the Burlington showing and the Toronto ones. The feedback we received was very strong, with former Olympian Sue Palmer-Komar (attending with her family), commenting, "it was great, and makes me want to race again!" 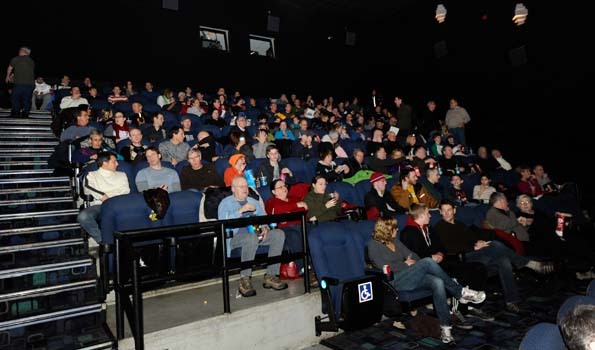 According to Gripped Films, Chasing Legends screened to almost 6,000 people on February 2nd across all of Canada. Over 50 cities saw both die-hard cycling fans and movie-goers alike attending the show. This is the third documentary from the independent studio and focuses on the toughest and most celebrated sporting event in the world - the Tour de France. Steeped in history, legend and lore the film pays tribute to the legends of yesterday while emphasizing the tenacity of the sports most prolific heros today and includes commentary from Lance Armstrong, Eddy Merckx, Mark Cavendish and George Hincapie. The movie can be purchased at www.ChasingLegends.com.